Many people are constantly trying to wind an effective way to stimulate hair growth. There are various natural remedies that people have used and passed down from generation to generation, confirming that the hair really does grow faster. The people from Huangluo Village, also known as the long-hair village, are well-known for their long and shiny hair, with no grey hairs. 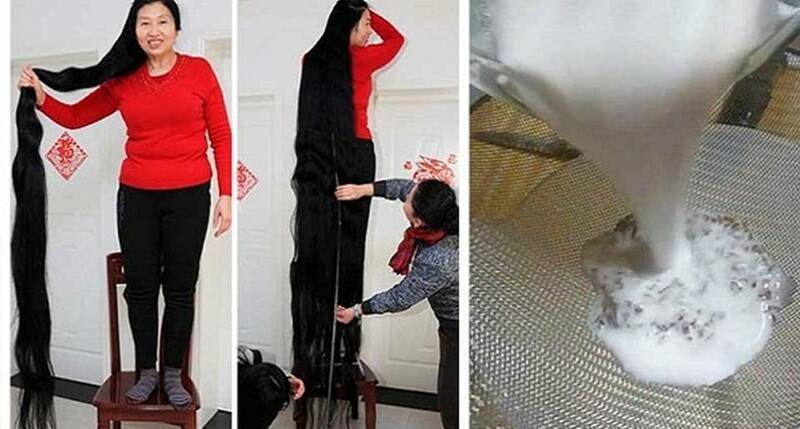 Women who live there have hair up to 1.4 meters long. They have received a Guinness award for the “world`s longest hair”. Wash a cup of rice with water to get rid of impurities. Place it in a bowl and pour with water. Let it stay for 15 minutes, stirring occasionally. Keep it at room temperature for one day, until it becomes slightly acidic and starts to ferment. Put it in a saucepan, boil and let it cool. Add a few drops of essential oil such as lavender or rosemary. Use this water as a shampoo and gently massage your scalp. Women in the Huangluo village have been washing their hair with this water for hundreds of years. The water is abundant in antioxidants which strengthen the hair and stimulate hair growth. They cut their hair once when they turn 18, and since then, they wash their hair with rice water. The results are totally unbelievable!